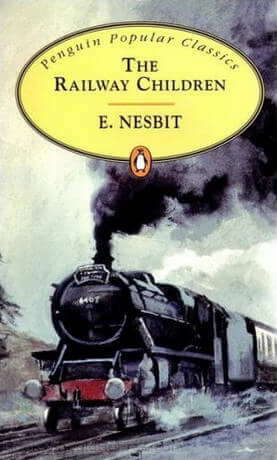 The Railway Children is a fairly well-known book written by Edith Nesbit. It follows the adventures of Bobby, Peter, and Phyllis, the three Railway Children. When their father is sent away, they and their mother move to a new house that is much smaller, which is near to the railway. The children soon get into the habit of sending their love to their father, who is in London, through the trains which pass through their little station. This book chronicles their various adventures connected to the railroad. It’s hard to summarize the plot of this book, as it’s written from the perspective of the three children, who naturally don’t understand everything, but in general it covers the adventures of the children, which range from befriending a Russian author to saving a boy in a railway tunnel with a broken leg. When their father must leave, the children and their mother (who is never named), move away from their London house and move to the countryside, to a very small house where they must be “poor.” Throughout the story, the plot of the children’s father ties the various adventures together. Edith Nesbit’s forte is definitely description. Her characters are flat, and her plots are simple; the book is really a collection of short stories, but her description is interesting and fun to read. The art of actual writing is truly mastered in this book. Of course, the book is interesting – just a little different having been written a century ago. Overall, The Railway Children is a delightful read and one that I found I still enjoyed even after ten years since I’d read it last. I recommend it if you’re looking for a quick read. I’ve been wanting to read this for awhile, I love her book “Five Children and It.” Thanks for the review!